The Hook delivers New Brunswick stories that capture your attention and make you want more. The stories might be humorous or serious or just entertaining. But they will always be thought-provoking. In 1978, Bob McCready saved Premier Richard Hatfield's government. McCready was a Liberal MLA who was appointed Speaker of the Legislature by the Progressive Conservative premier. It padded Hatfield's narrow majority in the legislature. With another potentially close election coming this fall, CBC New Brunswick's provincial affairs reporter Jacques Poitras reveals the untold story of the Speaker's Choice. In January 1978, RCMP officers Perry Brophy and Barry Lidstone were escorting Bonita Crombie to a trailer in Hoyt, N.B., where her estranged husband lived. Crombie was terrified of her husband. Shortly after the Mounties arrived at the trailer, they were shot to death. It was a shocking crime and one that 40 years later is still used to train RCMP cadets on how to respond to domestic violence calls. For more than a year, the family of 33-year-old Matthew Hines believed he died from a seizure. The true story of his final two hours inside Dorchester Penitentiary would devastate and haunt them. 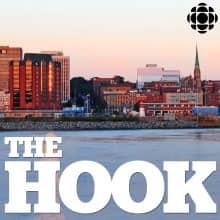 The Hook takes you inside the CBC News investigation into Hines' death, from no foul play to criminal charges being laid. Karissa Lindstrand made headlines when she found a lobster with what appeared to be a Pepsi logo stamped on its claw last fall. The curiosity surrounding the colourful crustacean was picked up around the world. But the so-called Pepsi lobster story is also raising serious concerns about the larger problem of plastic and garbage in the ocean. Biologists and other researchers are trying to better understand the magnitude of the problem and what can be done in the future to avoid future Pepsi Lobsters. Ten years after returning from Afghanistan, Sheldon Roberts is still fighting for his life. Roberts discusses his biggest battle, the battle with post-traumatic stress disorder. Until North Atlantic right whales started dying in frightening numbers in the Gulf of St. Lawrence, there was little talk of the lucrative snow crab fishery off New Brunswick. Freelance journalist Karen Pinchin explores how the multimillion-dollar fishery started and what the future may hold for the industry as it navigates new demands and emerging obstacles. Across New Brunswick, there are dozens of food banks and soup kitchens feeding people who are struggling. But after nearly 40 years of fundraising and food drives, the number of people in need continues to rise. So, is it time to end charity? The CBC’s Vanessa Blanch takes a closer look at food banks and soup kitchens across the province. Now that New Brunswick is shifting out of crisis mode following the devastating flood, it's time to start looking at the big picture. This week's episode is all about flooding, from new development rules, to incentives for homeowners, to relocating outside the flood zone. We meet some of the urban planners, not-for-profits, and ordinary folks coping with the new realities of climate change. They share practical steps you can take to deal with future floods. Spies, intrigue, Cold War politics: It all came to Saint John in 1974 when some well-meaning people tried Marxist Leninist politics on for size. But a young Nelson Cloud finds he's in a little too deep when the RCMP Security Service tried to turn him into an informer. The CBC's Viola Pruss takes you on a journey as she searches for clues about her great grandfather Max Pruss, the captain of the Hindenburg airship. The Hindenburg, the world's largest airship, crashed 81 years ago. This podcast includes portions of Pruss's award-winning documentary about her great grandfather and his connection to this tragic crash. Uptown Saint John has a reputation for strange characters — and the 16 sandstone figures carved on the Chubb's Corner building are no exception. How they got there, and who they're supposed to represent, have been a mystery since 1878. The truth has to do with the rebuilding of Saint John after the Great Fire of 1877, and the artists and politicians that helped shape an era in the history of Canada's oldest incorporated city. Deana and Peter Gadd didn't plan on hosting more than 540 crazed birders from across North America in their backyard this winter. But a lonely European mistle thrush changed all that. Vanessa Blanch and Alain Clavette tracked down a flock of birders to tell the story behind this “mega-rarity” in the birding community.